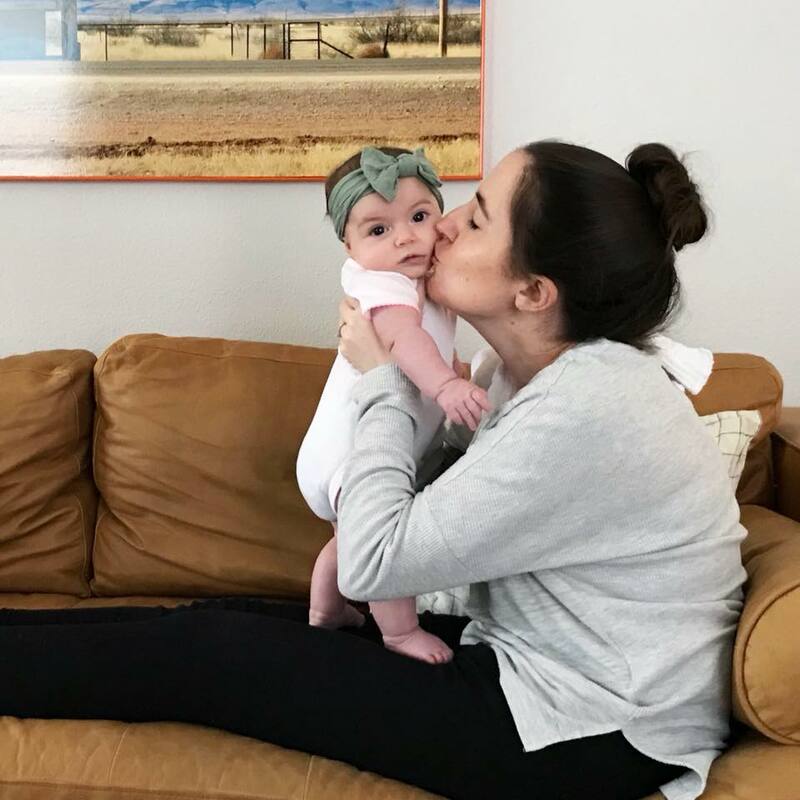 Olivia West | Seven Months — K L E P A C & C O . Seven months! This girl is just full of personality these days. And dance moves. More on that below. Since there isn't a pediatrician appointment at the seven month mark we took our own measurements ha. She currently weighs in 16lb 13oz, she is 27" long, and we have no idea how to measure her head. Olivia is pretty much a professional eater at this point. She no longer has any issues with nursing and has become extremely efficient clocking in at about 4-5min on each side. How did I ever survive her 45-60min a side method in the early days? So crazy. We have officially started her on solid foods and I think its so cool that she just automatically understood how to use a spoon. As I mentioned in her last month update I made a ton of purees of each fruit and veggie for Stage 1 eaters and we are slowly working our way through them. I leave a 4 day gap in between each new food introduction to rule out allergies or tummy issues. So far she has been just fine trying new foods. We started with avocado (meh), zucchini (meh), pumpkin (obsessed), and butternut squash (double obsessed). With the avocado and zucchini she barely finished an ounce serving, but with pumpkin and butternut squash she wolfed her serving in a few bites. My little fall baby. We are waiting to try all of the veggies before we start introducing fruits so that she won't have a preference for sweeter foods (like her parents ha). She is still nursing regularly, and we only give her solids once a day around dinner time. While she is still a solid night time sleeper (praise be), she definitely hit a sleep regression this past month. It has since passed but a few weeks ago when I'd put her down for a nap or for bed she would lay there for at least an hour not crying, just rolling around and babbling. It was so weird. We aren't sure if it was officially a sleep regression or her tummy troubles from getting used to new solid foods. Because after she would (finally) poop she would be totally fine and sleep like a champ the next day. Poor girl. Now that she is adjusting to the new textures of solids she hasn't had any sleep issues, but for a while it was like we were starting over on her sleep training (minus the crying part). Did anyone else experience this? Olivia now tries to imitate the noises we make and will practice them on her own. When she wakes up in the morning I can her her popping her tongue on the roof of her mouth haha. She also started doing this funny little hula hoop wiggle and will now do it on command. She usually does it when she's really happy. During a diaper change, in the bath, nursing, etc. She also laughs and laughs like a deep belly laugh if I bless Geoffrey after he sneezes. It can be any one else sneezing and she doesn't care, but when her puppy brother sneezes she thinks its SO funny that he gets a "bless you" just like her. She is almost crawling. She sort of just spins in a circle though. Or she will barrel roll from one place to the next. It's not as efficient but it works. Lately she has been getting on her hands and knees and sort of rocking back and forth, so I feel like she's almost there. She still loves her activity center and her baby gym. She also loves sitting in her high chair and playing with her stacking cups and watching Geoffrey walk around below her. She is about 98% of the way to sitting up unassisted. In fact she'll sit for like 5-10min and I'll forget she isn't officially sitting up yet and she'll just tip over without warning haha. She still loves her doorway jumper to the point where if you try and stand her up on the floor or your lap she'll just bounce haha. We took our very first long road trip a couple weeks ago, 5 hours to Dallas and then another hour to my parents house. From San Antonio to Dallas she was totally fine. She never cried or anything and just quietly played and napped the entire way there and back. However, the 3 hour pitstop in Dallas really put her and Geoffrey over the edge, and we hit a ton of traffic on top of it all so there was a bit of a melt down on the hour drive to my parents. But I'll take it! We have started taking her to more restaurants especially now that she's big enough to sit in the high chairs (for the most part). It helps her feel more included rather than being strapped in her car seat while we eat. She also now reaches up with her arms when you go to pick her up. She is still wearing size 3 diapers 6-9m clothing. Lately she loves to just raise her hand and we'll ask "yes do you have a question?" haha. She definitely knows what the phone and camera are and will instantly smile and pose for her photo being taken. I think the hula dance is by far my favorite thing, and her laughing at Geoffrey's sneezing. Her personality is just blossoming right before her eyes and I can't take it. Every day is just so exciting to see what she will do next.